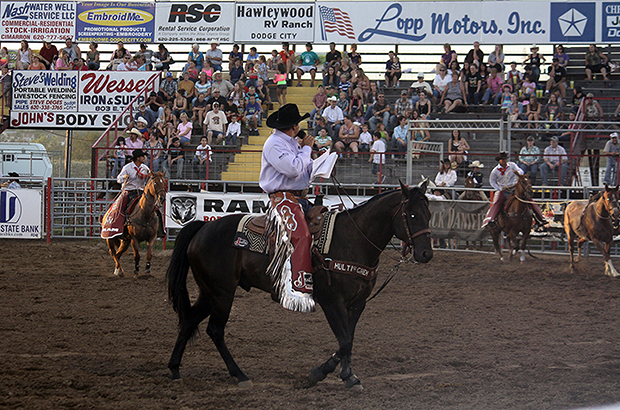 DODGE CITY, Kan. – There are a lot of reasons thousands of people flock to this southwest Kansas city every summer to take in the annual Dodge City Roundup Rodeo. The event has long been considered one of the best in the Professional Rodeo Cowboys Association. Nine times it has been honored as the Rodeo of the Year; last July, Roundup was inducted into the ProRodeo Hall of Fame. It takes great community support to produce such a prestigious event, but there are a lot of superior things that happen in order to make it an annual spectacle. “I think we have some of the greatest people involved in our rodeo, and that makes a huge difference in the product we put out before our fans,” said Dr. R.C. Trotter, chairman of the volunteer committee that produces the rodeo, set for 7:45 p.m. Wednesday, July 31-Sunday, Aug. 4, at Roundup Arena.. “We’re the richest Silver Tour rodeo on the Wrangler Million Dollar Tour and the richest rodeo in Kansas. Those are high credentials, but there also is a personality that is involved with every rodeo performance. That’s where committee members lean on the experts in the sport to handle the heavy lifting: stock contractor Harry Vold Rodeo, chute boss Art Alsbaugh, secretary Linda Alsbaugh, announcer Boyd Polhamus and sound technician Benje Bendele. Bendele is the premier soundman in the sport and works most of the major rodeos in North America, including the Wrangler National Finals Rodeo. Polhamus has been named the PRCA’s Announcer of the Year four times and has announced the NFR 17 times, including the last 14 in a row. “Boyd is an integral part of Roundup Rodeo and has been for a long time,” Trotter said. A key reason why Polhamus has found success in Dodge City and other major events is because of the passion he brings to the arena. Bendele has seen it as closely as anyone. Not only does he work closely with Polhamus during the rodeo, the two have been friends for better than 20 years. Bendele understands his role in how each performance is played before the fans. The Harry Vold Rodeo Co. has been a fixture in Dodge City for decades; moreover, the Vold name has been a fixture in rodeo for more 50 years. Vold has been named PRCA Stock Contractor of the Year 11 times, and he was inducted into the ProRodeo Hall of Fame in 1994; he received the Legend of Rodeo honor in 2009. Now the operation is managed by his daughter, Kirsten. “I have absolute faith in what the Volds bring to Dodge City every year,” Trotter said. “They bring great stock themselves, and they’ve reached out to other stock contractors to make sure we have the best livestock possible at Roundup.